The Church of St. Elizabeth of Hungary was founded by immigrants from Slovakia, then part of the Austro-Hungarian Empire. 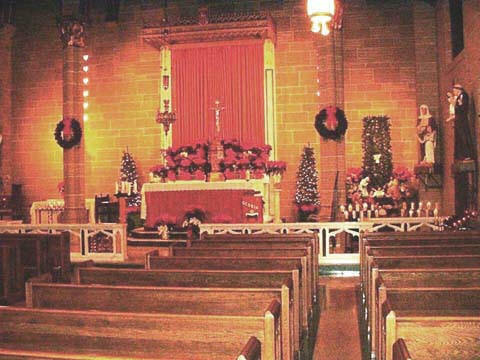 The first Mass was celebrated on April 26, 1891 in the basement of St. Bridget's Church on 8th Street and Avenue B. The parish was formally incorporated on November 25, 1891. The church was first built at 345 East 4th Street, and the first Mass in the new building was celebrated on August 7, 1892. In the early decades of the church's life, there was a constantly changing series of pastors and priests. True stability for the immigrant parish was guaranteed by its lay leaders. As the people of the parish began to move out of the Lower East Side, it became necessary to relocate the church. The pastor and trustees found and bought a Lutheran church on East 83rd Street. The new parish church was established on June 7, 1917. It was blessed by a representative of the Archbishop of New York on May 30, 1918. After extensive renovations and the purchase of the rectory, the church was blessed by Cardinal Hayes on November 8, 1928. If the early years of St. Elizabeth's was marked by instability, at least in terms of its pastors, after the move to 83rd Street, it has enjoyed great stability. There have been only four pastors: Msgr. Alexander Butkowsky, Msgr. Andrew Dzijacky, Msgr. Andrew Dvoracky, and Msgr. Patrick McCahill. Because of its dwindling Slovak population, Terence Cardinal Cooke designated St. Elizabeth's as the church for the Deaf Catholics of New York on July 1, 1980. It became a favorite of Cardinal Cooke's successor, Cardinal John O'Connor, who celebrated Mass here almost every year for the Deaf people of New York. Before his death in 2000, Cardinal O'Connor celebrated his final Eucharist outside of St. Patrick's Cathedral here at St. Elizabeth's. St. Elizabeth's is a lovely church; and in the midst of the cacophony of Manhattan, it provides a haven for quiet reflection, peaceful prayer and an intimate setting for liturgical celebrations. Some copies of the centennial history of the parish are still available on request.